running drop-in centers, classes, and after school programs. I had the chance to be a part of LNY's mission from 2010-2011 when I was employed by them to run an after-school program on the East Side. I had a fantastic time and, while there were many challenges, I look back on my time with the kids as something I was incredibly lucky to be able to do. I'll never forget one day when I read them old-fashioned Grimm's fairy tales and then we all talked about what fairy tales are like and why we tell them to each other as a society. They were in grades K-6 in failing schools and they were often kept awake at night by gunshots, but let me tell you, they GOT IT. Why are good people pretty and bad people ugly? Why is everyone all good or all bad? Why do good things happen to good people and bad things happen to bad people? I am tearing up just remembering. We all went home to different things, but those afternoons together were truly golden. I wanted to stay involved but I couldn't commit to being a tutor. Luckily there are lots of other ways to support what they do. Volunteering, donating, and voting are all great ways to make sure they can keep doing their important and incredible work. One way you can advance their mission indirectly is to support a culture of reading in Buffalo. I am one of the biggest book nerds you can find, and I love being in a place that publicly celebrates reading on the grassroots level. Some of my favorite ways to celebrate reading in Buffalo are the Buffalo Reading Invasion, shopping at local bookstores like my favorite Westside Stories, book clubs like the Lovin' On Buffalo Book Club, and Buffalo's Little Free Libraries. 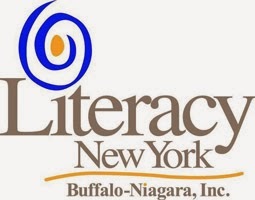 Perhaps the most fun way to support literacy in our region is to attend Literacy New York Buffalo-Niagara's annual fundraiser, Cocktails in Character. Yes, it is what it sounds like - dress up as your favorite literary character and enjoy cocktails and entertainment! It will be held in The Hotel Lafayette, which has been such a fantastic example of the reuse and revitalization of old Buffalo treasures. It seems a perfect setting to celebrate a renewed commitment to addressing some of Buffalo's biggest ongoing struggles. At this year's event, people with VIP tickets will have the chance to take a half-hour behind-the-scenes guided tour of the historic building. If you bought a regular price ticket but you're dying to go on the tour, guess what? There will be one additional tour offered exclusively for Enjoy Buffalo readers. An announcement will be made that night telling you where and when to meet. When you show up to take the tour, you just need to tell the organizers you are a guest of Enjoy Buffalo in order to join. If you know someone who is going, be sure they know about this, too. There are lots of great events in Buffalo, but I have limited resources and time, so only a few actually get me to attend. This is one of them. This will be my third year attending (yes, in costume) and I hope that many of you will join me! Follow the night on Twitter using #CinC13. “The value we create is directly related to how much valuable information we can produce, how much trust we can earn, and how often we innovate”. Seth Godin, one of the most intuitive marketers of our time (and who lived in Buffalo as a kid), insists that the world has entered the Connection Economy. The connection economy has different rules from the industrial economy, and therefore different winners and losers. Thank God. Buffalo was a loser for the last fifty years of the Industrial Economy because it rewards those who can produce the most average products or services for the lowest possible price. With massive competing economies across the globe, the situation was untenable for Buffalo and many other cities. Buffalo failed at being average so horribly, that it went from the fifteenth largest city in the country to out of the top 70 in sixty years. That might be a good place to start in the Digital Age. According to Godin, the connection economy “has enabled the weird edges, where people who care find others who care and they all end up caring about something even more than they did before they met”. Sound familiar? By the way they fall on the bell curve, people who serve refugees, lobby for bicycle-friendly infrastructure, advertise Buffalo for free, form volunteer groups, and plant gardens in empty lots are the “weird edges,” Buffalo’s flatline has turned into a faint pulse because these people have connected. “Most of all, the connection economy has replaced [average] with an insatiable desire for things that are new, real, and important”, Godin argues. Being able to watch concerts together on our waterfront is new. Restored craftsman buildings in our urban core are real. Reusing a city, so we destroy less of the Earth is fundamentally important. The desire for a new, real, important, Buffalo is so insatiable that thousands of people express it as the core of their identity. “Tribes of talented individuals who are connected, mutually trustful and supported by one another are in a position to create a movement, to deliver items of value, to move ideas forward faster than any individual ever could”. I’m guest-posting on this blog because I was able to connect with someone else who wants to improve Buffalo as much as I do. We have each found others we trust, who we want to support by creating value for them. Our tribes connect and merge as part of the process. Buffalo is the perfect city for meaningful connection. There aren’t that many of us. For once, that’s a good thing. We live so close to each other, and can get so close to many of our problems, that we have a major advantage over places where it is harder for people to connect. “If you interact with others, you have the ability to create something new, something that changes everything,” says Godin. Go to a group meeting. Follow a few very active “Buffalo” people on Twitter. You’ll notice that many of them overlap. The right people are connecting with each other. Because they’re interacting, they care even more about Buffalo than they did before. They create even more new, real, and important things, and the tribes grow in the process. This is the reason you feel a different energy in Buffalo than you did ten years ago. This shift in energy is why you should fear being uninvolved more than taking risks. What if no one reads my blog? What if people think my painted piano at Canalside is stupid? What if I volunteer to clean up a street in Black Rock and I look like a phony outsider? It’s taking these risks that lead us (and therefore Buffalo) to get rewarded. The risk is what makes it meaningful, what makes it generous. Uninvolved is average. Average is handed to the lowest bidder and ignored. Ignored is switch cane poor in the connection economy. Take the risk. Connect. Be a part of the new, real, important, Buffalo. This summer I spent Garden Walk weekend celebrating, because I had just joined the board of one of my favorite Buffalo nonprofits. I first "met" Grassroots Gardens of Buffalo while I was working on Grant St, and loved both what they were doing and the fact that they had such a stellar reputation. If you haven't "met" them yet, they are a nonprofit that leases and indemnifies vacant city lots when a neighborhood wants to create a community garden. I'd kept my eye on them over the past few years, but had never gotten involved since I'm not a gardener. Every spring I excitedly renew my dreams of being a gardener, but after killing 2 jade plants and accidentally putting the third in the refrigerator for a week (it's doing fine), I have to admit to myself that making green things grow is just not in the cards for me. After I was reintroduced to Grassroots Gardens of Buffalo through the United Way, I searched through their online presence and was amazed at how much their vision for the city resonated with my own. Their approach is that real transformation happens because of the work of passionate neighborhood gardeners...Grassroots just clears away obstacles so that the gardeners can succeed. Their vision is stunning: using shared green spaces to reimagine and strengthen communities by enabling the communities to make their own changes. They are passionate about the transformative power of community gardens for our city, and it's easy to see why. "After more than a decade of work, we are seeing the positive impacts of community gardens in our city. In areas that have been desecrated by high crime and poverty, neighbors are coming out of their homes, engaging with one other and working side-by-side again to beautify and rebuild their neighborhoods. Block-by-block, the city’s streets are being transformed back into neighborhoods." Hope to see you there this Thursday! In addition to the attractive vision, I've found that the down-and-dirty work of the organization is just plain fun. My first day was spent listening to a classical violinist on a warm summer night amidst lush plants and laughter. I love admiring a garden and then realizing, "that's one of ours." If you were involved you might be learning yoga in a garden, attending free workshops, weeding with your neighbor, or picking your own salad all summer long. We also work closely with other stellar community organizations you've heard about, like Urban Roots and the Massachusetts Avenue Project (MAP). There's more to say than I can fit here, so check out our work for yourselves. Our website is www.grassrootsgardens.org, and we just joined Twitter as @GGBFLO. 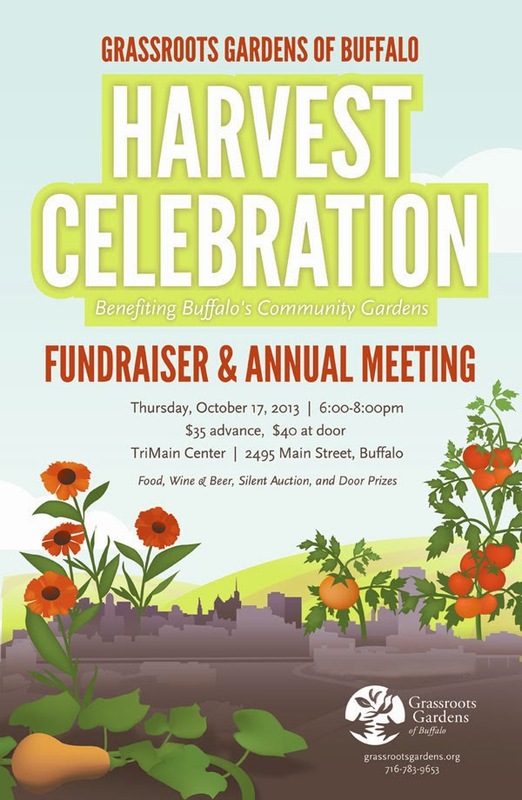 The next opportunity to get to know the organization is coming up on Thursday (10/17), when we will have our annual Harvest Celebration. The event is a night of food and fun where you will be able to support our work and also meet our gardeners, staff, and other supporters. See our website for more details - or, if you're not the planning type, you can stop by the Tri-Main building at 6pm. There are many ways of making our city better. None of them is the single answer, and all of them contribute something good. If we have passionate people working on many different problems and solutions, we will be able to slowly move the city forward. Find the place that appeals to you most, and join in.